When choosing a wedding rings for women it is important to decide the style that will most compliment the engagement ring and your personal taste. Over the years, many women will simply add a band that matches the engagement ring, which means that wedding rings in jewelry stores will usually reflect the popular style of the day. The matching wedding band is a solid choice for the bride wanting a beautiful engagement ring that compliments the engagement ring. Wedding bands for women have not changed much over many years. There are still channel or prong set diamond bands in eternity or just across the top of the band. 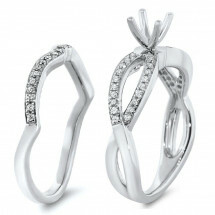 What has changed are the styles chosen used for wedding rings. For example, brides with a white gold engagement ring are choosing all types of styles to go with their engagement ring regardless of it matching in metal color or style. Women are choosing plain bands, diamonds, gemstones, and vintage designs on top of the styles that were intended to go with the engagement ring they chose. 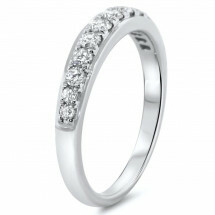 The plain band is usually a choice when a bride does not want anything else to take away from her engagement ring. 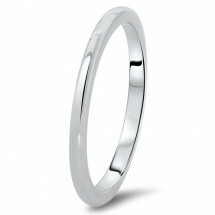 The plain band is usually no more than 2 mm wide, about the same width had it the band had diamonds. 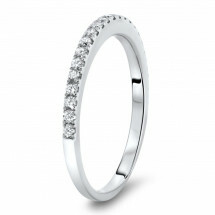 Diamond bands can vary. 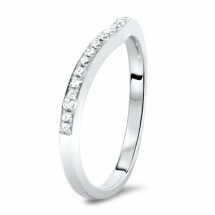 Today, diamond band are narrow with prong set diamonds across the top of the band. 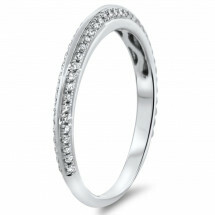 The eternity band is popular as well, where the diamonds go all-the-way around the band usually varying on diamond size. 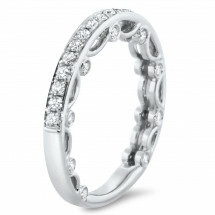 Those who chose an eternity band usually have a carat weight that is noticeably heavier than the side diamonds in their engagement ring. The most popular use of gemstones is sapphire that alternates with diamonds, drawing attention to the coolness of its display of color. Another use of a stand-out design is the vintage band. 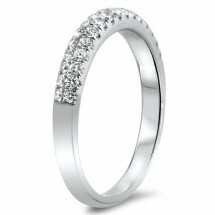 Vintage bands can vary considerably, but are usually detailed in milgrain and have undulating patterns. The point is to look very different from the engagement ring. 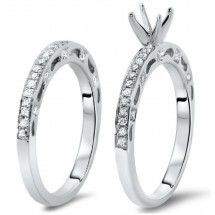 Some women are looking for a wedding rings to wear in place of their engagement ring. The engagement ring may be impractical in certain professions, like those in medical fields wearing gloves. 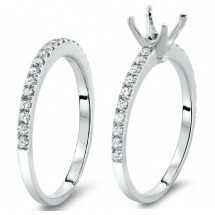 A flatter style may be more conducive like most wedding rings for women. Whatever the reason is for choosing a wedding ring, it should still be an extension of her personal style and a compliment to her relationship. 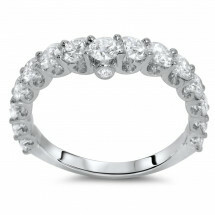 Whether the band has gemstones, diamonds or plain a band of gold, the ‘I DO’ will still be everlasting.